The nights are getting darker, tears are being shed over the latest sentimental John Lewis Christmas ad and apparently the Coca Cola Truck is coming to our town soon. It can only mean one thing: it’s nearly party dress season! I love vintage party dresses, they are just so glorious! I’ve got a mixture of everything here from glamorous 50s gowns, to 60s shift dresses, 70s lurex maxi dresses, to 80s strapless glamour. My favourite is the 80s does 20s flapper dress, but I love every single one of these beauties. Which is your favourite? Nothing for you here? 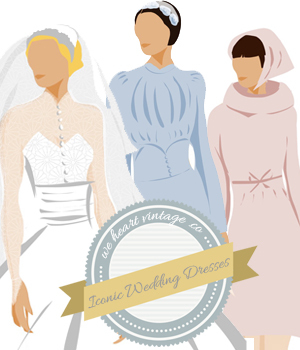 See my other vintage fashion collections here. If you run a vintage store and would like to be included in future features like this one make sure you sign up to my Vintage Directory and I’ll be in touch when I’m looking for vintage to feature! Thanks for featuring my party dresses in this beautiful collection Mary. So many stunning dresses, so little time! Thanks so much for the feature! The dresses in this collection are all so lovely! I wish I could have them all! That’s how I feel about them too. It’s my fantasty vintage wardrobe! Glad you like my selections! Thank you so much for featuring my 1950s Dotted Swiss Prom Dress. Your collection is excellent! I was honored to be included. Thank you again. Wow I love the party dresses In love with this dress- the color is absolutely beautiful!